How can we avoid danger when we start driving and when we merge with traffic? Danger can be prevented by turning on all the distress signals and warn other drivers while merging with traffic. Danger can be prevented by driving diagonally and at a higher speed while merging with traffic. By quickly entering the lane in which traffic is flowing. By giving an appropriate signal with the winker, looking in all directions and waiting until no one is obstructed.before driving. When is a vehicle affected by centrifugal force? How would you keep your vehicle balanced when approaching a curve in the roadway? 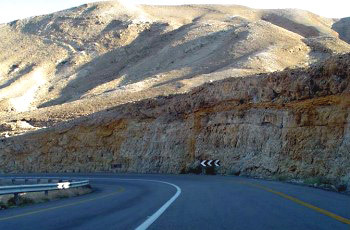 You should slow down before entering the curve, and accelerate when coming out of it. You should shift into high gear. You should shift into neutral gear. You should drive faster before entering the curve. “Drinking alcohol disrupts the coordination between limbs”: Correct or incorrect? It depends on the driver. How should the driver of the silver vehicle respond, when the driver of the dark vehicle wants to park his vehicle in reverse between two vehicles next to the sidewalk? Enter the parking by himself and prevent the driver of the dark vehicle from parking. Slow down or even stop and allow the driver of the dark vehicle to finish parking. Continue driving normally, as if he did not identify the intentions of the other driver. Drive closer to the dark vehicle, honk, and overtake it quickly. What are you required to do when during a night drive you are confronted with a vehicle that doesn’t dip its lights and blinds you? Slow down and keep as much as possible to the right. Turn on the high beam to overcome the blinding effect of the other vehicle. Drive faster to shorten the duration of being blinded. How can a driver handle the many tasks he needs to perform when approaching an intersection? Warn other road users that he is approaching the intersection (by honking and signaling). Ignore other road users; especially those smaller than him. Drive faster in order to cross the intersection more quickly. 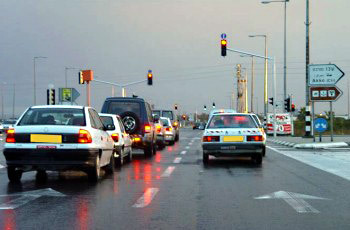 Slow down before the intersection, look around, and avoid engaging in any activity other than driving. According to the picture, what limitation is faced by the green (commercial) pick-up truck that wishes to turn right? 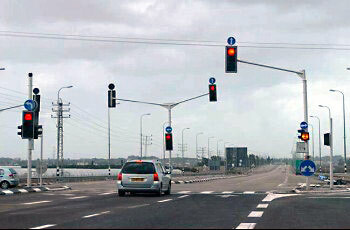 The motor scooter intends to drive straight; hence there is no danger in turning right. The driver of the pick-up truck should be careful, because there is another vehicle driving in a “blind spot” to his right. 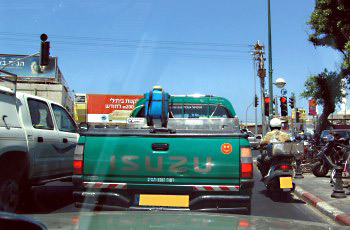 The pick-up truck is statutory prohibited to turn right. 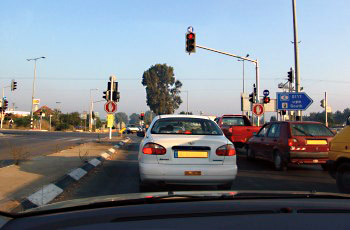 The white vehicle (1) and the silver vehicle (2) at the intersection, intend to enter the same road. Which of them is obliged to give right of way? The first one to turn. The first one to enter the road. The silver vehicle (2) at the intersection. How should one change lanes? Signal with the winker and make a short diagonal deviation to the intended lane. After checking and taking account of the position and speed of other vehicles in the intended lane. Drive as close as possible to the desired lane, and when no vehicle drives behind you – signal with the winker and make a short diagonal deviation to the intended lane. Deviate quickly and fearlessly in a short diagonal, and verify that you are signaling with the winker. What should a vehicle driver do in case of a strong side wind? Slow down and adjust the driving speed to allow him to control the vehicle – . He should avoid driving on roads with side winds, or he should otherwise stop on the “hard shoulders” until the wind fades. Turn on the fog lights and continue driving normally. Drive faster to avoid the side wind. How would you drive a motorcycle on a rough non-urban road? Drive slower because there is a risk of losing control. Drive faster to minimize your stay-time on the rough section. 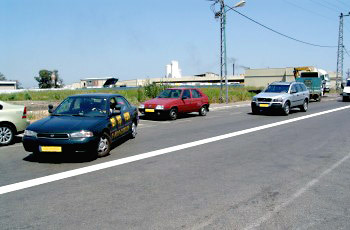 Continue driving at the same speed but avoid overtaking. If the motorcycle’s tires are new you can continue driving safely at the same speed. In order to protect the tires. In order to determine the driving speed.without strain on the engine. 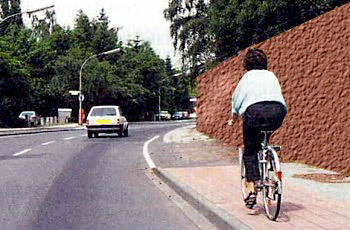 You are driving a vehicle that approaches the cyclist in the picture from behind. What risk might be posed by the cyclist ? There is no risk. Pass the cyclist quickly. The cyclist might pull onto the roadway or otherwise trip and fall into it. The cyclist rides on the sidewalk (pavement) and therefore the bicycles pose no risk. The cyclist is an adult and poses no risk. 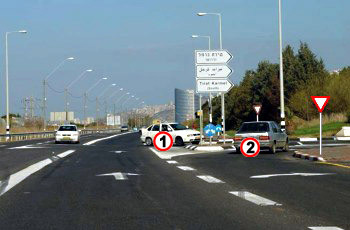 Which of the vehicles displayed in the picture is not parked correctly? 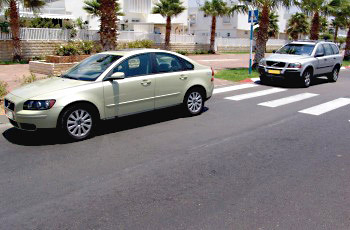 The vehicle parked while the pedestrian crossing is behind it. Both of them are not lawfully parked. Both vehicles are lawfully parked. Overtakes on a two-way road. Arrives to the beginning of a steep uphill climb. Overtakes on a one-way road. 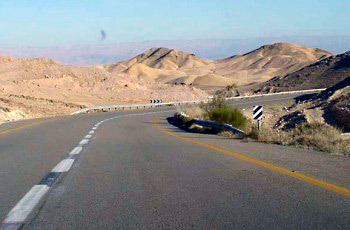 Drives down a steep or long descent. What are the reasons for a vehicle skidding on a road? Late and sudden braking and the presence of elements that prevent traction on the road’s surface. 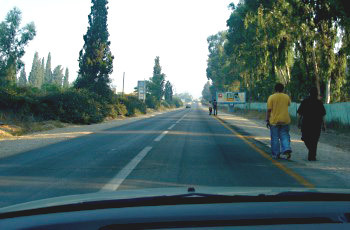 Roads with a high coefficient of friction. Tires that are not worn out cause vehicle skidding.